I am going through this procrastination funk, resulting in this entry 3 weeks over due. Kartikasaurus came to Da Hu with her parents during the National Holidays and we decided to check out the Shanghai International Fireworks Festival. 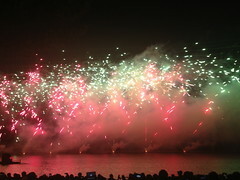 The event was held over several days with each representative country showcasing their fireworks awesomeness. That evening where we attended featured Australia followed by Mexico. It was closed to two hours of non-stop fireworks. Initially, we got the standing tickets but our dear girl left them in the hotel when we headed out. There was no way to head back and get them but I was lucky to have the good fortune of having a friend scoring us seated tickets out of the magic top hat. It was a good decision to switch to the seat area was man..... there were MANY MANY MANY people!!! On hindsight, we should have headed to the park early as we had a lot of trouble getting to our seats with the standing-ticket peeps flooding the back area, virtually sealing every seated-ticket spectator in. Oh well, we did managed to get to our seats eventually but we had to watch a large part of the Australia display while tunneling through the harrowing crowd. 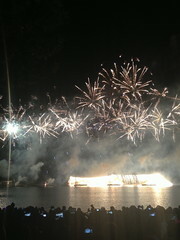 It was really nice to watch the fireworks display out in the open park and did I mentioned that the weather was awesome? Still, it got a bit tiring as there is only so many variations of explosions one can create in the sky. I was armed with my pathetic iPhone as my camera and my strategy for taking fast moving pictures in insufficient lighting as to take a shitload of them. You can be sure that if you take 3,252,627 pictures, you can be assured that a handful of them would be deemed acceptable and not blurry.